30-72% of Samsung and LG phones running IceCreamJellyPop will get Google Pay, er...Android Pay, within the next 2-3 fiscal business quarters! I believe he said during the keynote that it would be supported on any device that has NFC and KitKat+. So basically, any device that can do tap-and-pay in Google Wallet. And when are we likely to see this in the UK? I'd like to know this too. Come on Google, let us join the party! what about UK? Pleas inform us? I don't shop at corporate stores. How are you going to include local small businesses like vendors at the farmers market? And what about bit coin? If I could pay a vendor at the farmers market in bitcoin even if he doesn't know what it is, that would be pretty awesome! What's the relationship between this and Google Wallet? Yes, what will happen to google wallet? Any love, whatsoever, for Australia? Yet another "US Only" initiative! Does this mean we get Google Wallet in Germany for sellers at some point in the next 10 years? Indian Govt. will never allow android pay due to security reasons, since it never allowed to make payments via 'PayPal' in India. this will make negative impact on Google ppc business. US only? what about Europe? did you notice there are other countries? EMV tokenization spec? If so great leap forward against Breaches. Needs to be in Australia - we have the highest adoption rate for NFC for Paypass/wave anywhere in the world. Also, how will it be implemented? As an Android Pay specific negotiation similar to apple, which requires deals with every company, or as an emulated Mastercard/Visa/AMEX that could be used anywhere in the world? Tap & pay terminals are almost ubiquitous in Canada. Most of the banks here already have their own proprietary wallet for tap & pay (not in app purchase though). So on the one hand Canada would easily adopt Android Pay (have you seen how people are salivating over Apple Pay here) but on the other hand none of the banks really needs it (have you seen how much trouble Apple has had getting them on-board). Can I use this app into INDIA? It's so frustrating that the uptake of NFC payments in the UK is SOOOOO slow. It looks great and all - but the chances of me getting to use it at all in the next 12 months is pretty slim. 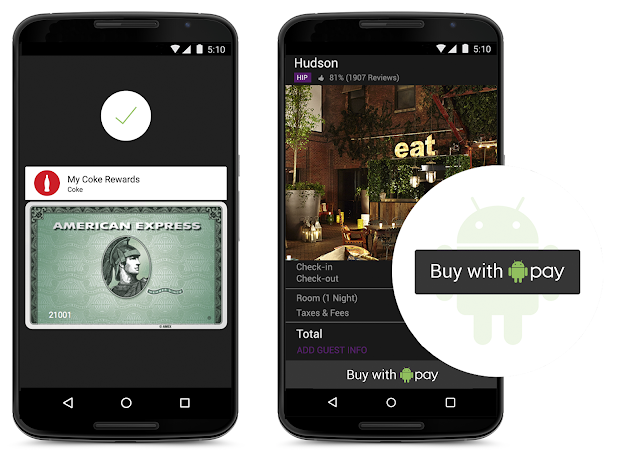 Is this Google Wallet or is this a whole new thing Android pay? I have Google Wallet and I love it! Its super quick I just hold my phone to the card reader, it beeps and I'm done! but yeah why rebrand the product. Why not just upgrade Google Wallet with these features? When will this come to Norway? Hello every one .. I am from India and Android Application Developer in Brainguru Tecnologies Pvt Ltd. I read your blog and agree this blog post.I would like to thanks for update this useful information.